This week the student group, the International Student Initiative for Pluralist Economics (ISIPE), wrote a letter to the Guardian newspaper complaining about the "lack of intellectual diversity" in the way economics is taught. Six months ago a group of academics had made a related point in another letter to the Guardian. Having spent 10 years at IDS it is clear that most social science disciplines have a greater tolerance of plurality and diversity than economics. That is changing with behavioural economics modifying the way we think about rationality and political economy changing the way we think about governance, imperfections and distributional consequences of markets. But has it caught up in the classroom and in the text books? I suppose not. The UK academics argue that this is partially because of the UK incentive systems whereby economics departments have to submit their best papers to the UK's Higher Education Funding Council for assessment of quality, an assessment that is related to future funding decisions. This may be the case, but the reasons are likely to be more profound than that (vested interests, power, status quo) and will take longer to change. I wrote about this in an article in the journal Development about 4 years ago. It was one of 5 dominant assumptions that I listed as being severely stress tested by the financial crises of 2007-2008. Economics as an analytical tool and as a generator of evidence has a primacy in the international development debate. This primacy has many drivers including colonial economics (Tignor, 2005), reconstruction (the establishment of the Bretton Woods organizations) and the economics of the great depression (Skidelsky, 2009). This drives and is further driven by the recruitment of economists at major international development research organizations. This primacy puts economics in the spotlight when things go wrong. Key assumptions of economics have been found to do violence to reality, and hence, via poor policy choices, violence to well-being. Core assumptions around information asymmetries, definitions of rationality, independence of behaviour, discounting and the ability to insure against all risks were shown wanting before 2008 (Coyle, 2007). Krugman (2009) ‘don’t mistake truth for beauty’ and Skidelsky (2009) ‘we need to acknowledge irreducible uncertainties’ elaborate on how economics got it wrong in the context of the global financial crisis. The LSE letter to the Queen describes the failure to predict the ferocity of the crisis as a ‘failure of collective of imagination of many bright people’, which leads me to conclude that there are not enough checks and balances in place to keep economics grounded in the real world where flaws and friction are the norm, not perfection and the absence of friction (Krugman, 2009). Dasgupta (2005) describes economic modelling as a ‘strategic simplification of complicated reality’. I would argue that the space over which such strategic simplification is valid is diminishing. In terms of the other great crisis, global warming and natural resource mismanagement, the use of economics gives us a very particular perspective and one that is different from environmental sciences. Collier (2010) shows how economistic models can generate views about our obligations to the future, which are profoundly different to those generated by environmentalists. He draws on mainstream environmental work to suggest an alternative: the idea of custody. Unlike preservation, custody of the natural world implies that the current generation has to have an answer to the future generation's question: If you used up these natural resources, did you leave us ‘man-made’ assets of equal value? Collier argues that if future individuals are wealthier, they will be awash with ‘man-made’ assets and will value the natural assets that we have used unsustainably even more highly than we do. While utilitarianism says that the richer the following generations the fewer are our obligations to save assets for them, the custodian principle suggests that the increased wealth of the following generations means that we have an even greater obligation to answer their question from the future in a satisfactory way. 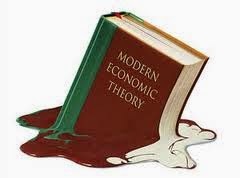 Of course, there are plenty of counter-views about whether economics is in trouble. Halsey-Rogers (2010) concludes ‘the global crisis does provide new information in key policy areas, but it need not provoke any crisis of confidence in the current state and direction of development thinking ... over the longer term, the crisis could have its biggest effects on the development thinking of those who are not development specialists. In many cases, policy prescriptions from policymakers and researchers from outside the development field have relied on implicit or explicit models that assume that developing-country markets function much more like textbook models than is actually the case’. But if those outside the development field have unrealistic expectations about how well markets work in the developing world, surely this raises the possibility that those from within the field and trained in the same universities will too. It seems to me that economists must become much more alive to when their models and assumptions can no longer offer a strategic simplification of complex reality and in fact when they begin to do violence to reality and to people's lives and livelihoods. This has fundamental implications for how economics is taught, the mix of disciplines that development research organizations hire and the heterogeneity of economics schools and economic schools of thought that they draw on." So interesting, thank you! My economics education was very stimulating and engaging - apparently I'm in the minority? But I did slog through the toy models. We all do, and with good reason. You need a foundation in your discipline before you can innovate. Sounds like maybe students want to innovate before they thoroughly understand what they're innovating out of. Economics students are being grounded in a discipline with a history that reaches back before 2007 (although they may not believe that is possible). That's not a bad thing.